Sixteen of North America’s best kayak anglers make up Hobie’s 2017 class of Top Guns. Brad Hole is a Pacific Northwest multi-species dynamo. Nebraska’s Kevin Workman catches anything that swims, but most especially largemouth bass. Brandon Barton ropes bull redfish across Florida and the southeast. Texas husband and wife team Mike and Sandra Morales are consummate angler educators. They join eleven other elite kayak anglers on Hobie Fishing’s 2017 Top Gun team. “The Top Guns are hand-selected fishing team members that have gone above and beyond. They are renowned for their skills on and off the water as anglers and as Hobie representatives,” says Kevin Nakada, Hobie Fishing Team Coordinator. Every 2017 Top Gun lives and breathes kayak fishing, and all of them have a gift for showcasing their corners of the sport. Beginning in February, they will share their know-how in weekly stories published on the Hobie Fishing blog and Top Gun page. With Top Guns spread far and wide across North America, the topics are sure to be diverse. Top Gun newcomer Chris Siebenthaler is a bass man through and through. His extensive tournament history is sure to feature in his stories. Eric McDonald will take viewers right into the heart of his battles with pelagic bruisers – sailfish, kings, even tuna. Jef Brewer will show us Northern California’s rugged coastline from the seat of his Camo Series Mirage Outback. “I was absolutely blown away when I heard that I had been selected as a Top Gun! 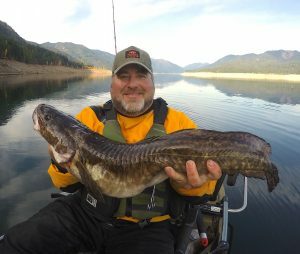 I am still trying to wrap my head being included with this group of incredible anglers,” he says. Some Top Guns are back for a second stint – a signal achievement. For Brad Hole, the consecutive selection is a motivator. “I look forward targeting new species and venturing a little further out of my comfort zone and sharing my journey along the way,” he says. Ross Gallagher is a passionate tarpon technician, a man who loves a wild ride. He’s making his second appearance on the team. “It’s a real honor to be recognized in the Top Gun Program again this year. This is a world class group of anglers who push each other to not only catch trophy fish, but produce professional level content along the way. Here’s to a successful 2017 season for everyone on the Top Gun Team,” Gallagher says.